Could Clyde be staying put at Broadwood? Big Clyde games at Broadwood - such as last season's play-off v Queen's Park - may yet be a long term option. 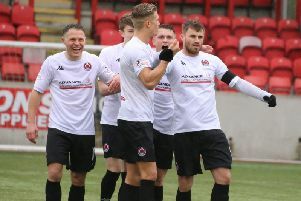 Clyde have not ruled out the possibility of continuing to be based at Cumbernauld’s Broadwood Stadium for the long term. Recent speculation has linked the club with a move back to a new purpose-built stadium in Rutherglen and in response the club issued a statement confirming that discussions had taken place. Two other sites are also being looked at - but in their statement Clyde insisted that staying at Broadwood was also a realistic option. The statement said: “The club recently began positive negotiations with North Lanarkshire Leisure (NLL), our landlords at Broadwood. “During these negotiations we advised NLL that we had for some time been looking at alternative locations for the club following many years of dissatisfaction at Broadwood, and that other than Broadwood we were actively looking at three potentially viable sites. “At that point the review of Broadwood was little more than an exercise for good governance as experience had shown that nothing that the club had to offer was valued by NLL. “The recent change of leadership at NLL has brought a change of approach that has returned Broadwood to being a very serious contender for our permanent home. “The club’s vision has been enthusiastically welcomed and a number of actions have shown significant goodwill towards the club.